Small Game- Squirrel, Rabbit, etc. 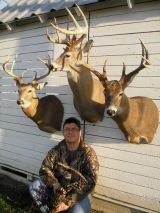 Post your small game hunting, rabbit , squirrel, etc.. pictures here on from this year and from past 5th Season hunts. What are skunks killed for?